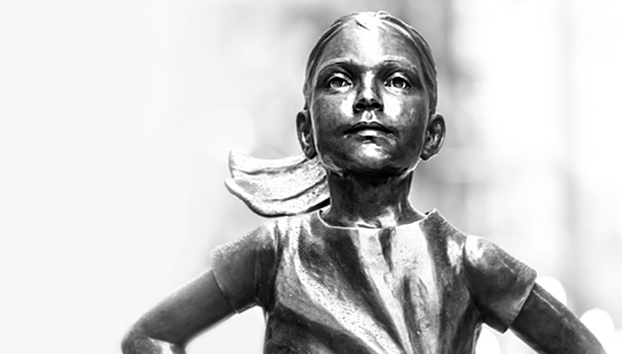 Asset management company State Street Corporation, which installed Wall Street’s Fearless Girl statue, has been charged with discriminating against “hundreds” of female executives by paying them less than their male colleagues. According to a recent filing by the US Department of Labor’s Office of Federal Contract Compliance Programs (OFCCP), State Street had paid female employees in senior vice president, managing director and vice president positions less than their male counterparts “since at least 1 December 2010”. During the same time period, it also discriminated against black employees in the vice president position, paying them less than their white male colleagues. As a result, State Street is required to fork out about US$5 million to 305 women and 15 black employees in senior management positions. State Street, however, denied those allegations, according OFCCP’s document. Rakhi Kumar, head of ESG investments and asset stewardship at State Street Global Advisors (SSGA), the investment management division of State Street Corporation, said in an email that the company is looking into how it is “holistically approaching diversity” based on the various factors that go beyond gender or pay, according to Bloomberg. Ironically, State Street has been an advocate of gender diversity in companies. In 2014, it was recognised as one of the 50 leading companies for women in the Asia Pacific Economic Cooperation (APEC) regional grouping. The assessment criteria for the survey, “50 Leading Companies for Women in APEC”, included evaluating State Street’s commitment to initiatives that support increased diversity, specific areas of focus it implemented for increasing opportunities for women and examining the tangible outcomes of these efforts. Wai-Kwong Seck, head of State Street’s Asia Pacific Global Services and Global Markets businesses, said State Street has clearly defined diversity goals, and that it is delighted to be recognised for positive action towards helping its female employees achieve their full potential in their careers. In March this year, it called on 3,500 companies to take “intentional steps” to increase the number of women on their corporate boards. This announcement came on the eve of International Women’s Day and led to State Street erecting the Fearless Girl statue in Wall Street. Last March, it also launched a Gender Diversity Exchange-Traded Fund (ETF) to track the performance of the SSGA Gender Diversity Index, which comprises US-listed capitalisation companies that score high in gender diversity on their boards of directors and in their senior leadership within their industry sectors. According to SSGA, the fund empowers investors to encourage more gender diverse leadership and support better long-term and social economic outcomes in support of gender diversity. Results are out! Which agencies passed HP’s diversity test? HP CMO’s demand for diversity: Should more clients follow suit? Are women under-represented in the marketing world? Sinclair Communications is tasked to drive awareness of the inaugural Arnold Classic Asia, to be hosted in Hong Kong in August 201..
Consumers showed an 81% and 68% increase in online visitors to e-commerce sites two weeks before and after the first day of Lunar .. In Singapore, Grab users can relax at the Plaza Premium Lounge at Terminal 1, Ambassador Lounge at Terminals 2 and 3, or Blossoms ..